Rituals are symbolic activities that help us, together with our families and friends, express our deepest thoughts and feelings about life’s most important events. Baptism celebrates the birth of a child and the child’s acceptance into the church family. Birthday parties honor the passing of another year in the life of someone we love. Weddings publicly affirm the private love shared by two people. The funeral ritual, too, is a public, traditional and symbolic means of expressing our beliefs, thoughts and feelings about the demise of someone loved. Rich in history and rife with symbolism, the funeral ceremony helps us acknowledge the reality of the death, gives testimony to the life of the decedent, encourages the expression of grief in a way consistent with the culture’s values, provides support to mourners, allows for the embracing of faith and beliefs about life and death, and offers continuity and hope for the living. Unfortunately, our mourning-avoiding culture has to a large extent forgotten these crucial purposes of the meaningful funeral. We must reinvest ourselves in the funeral ritual. This article explores the grief-healing benefits of meaningful funerals-benefits we are losing to the modern trend. Bereaved people who have these needs met, through their own grief work and through the love and compassion of those around them, are most often able to reconcile their grief and go on to find continued meaning in life and living. When someone loved passes away, we must openly acknowledge the reality and the finality of the death if we want to move forward to the healing process. Typically, we embrace this reality in two phases. First we acknowledge the death with our minds; we are told that someone we love is gone and, intellectually at least, we understand the fact of the death. Over the course of the following days and weeks, and with the gentle understanding of those around us, we begin to acknowledge the reality of the death in our hearts. Meaningful funeral ceremonies serve as wonderful points of departure for “head understanding” of the death. Intellectually, funerals teach us that someone we loved is no longer with us, even though up until the funeral we may have denied this fact. When we contact the funeral home, set a time for the service, plan the ceremony, view the body, perhaps even choose clothing and jewelry for the body, we cannot avoid acknowledging that the person has passed away. When we see the casket being lowered into the ground, we are witness to death’s finality. As our acknowledgment of the death progresses from what I call “head understanding” to “heart understanding,” we begin to embrace the pain of the loss-another need the bereaved must have in order to heal. Healthy grief means expressing our painful thoughts and feelings. Healthy funeral ceremonies allow us to do just that. People tend to cry, even sob and wail, at funerals because funerals force us to concentrate on the fact of the death and our feelings. For at least an hour or two-longer for mourners who plan the ceremony or attend the visitation-those attending the funeral are not able to intellectualize or distance themselves from the pain of their grief. To their credit, funerals also provide us with an accepted venue for our painful feelings. They are perhaps the only time and place, in fact, during which we as a society condone such openly outward expression of our sadness. To heal in grief, we must shift our relationship with the decedent from one of physical presence to one of memory. The authentic funeral encourages us to begin this shift, for it provides a natural time and place for us to think about the moments we shared-good and bad-with the decedent. Like no other time before or after the death, the funeral invites us to focus on our past relationship with that one, single person and to share those memories with others. At traditional funerals, the eulogy attempts to highlight the major events in the life of the decedent and the characteristics that he / she most prominently displayed. This is helpful to mourners, for it tends to prompt more intimate, individualized memories. Later, after the ceremony itself, many mourners will informally share memories. This, too, is meaningful. Throughout our grief journeys, the more we are able “tell the story”-of the death itself, of our memories of the person who passed away-the more likely we will be to reconcile our grief. The sharing of memories at the funeral affirms the worth we have placed on the decedent, legitimizing our pain. Often, the memories others choose to share with us at the funeral are memories that we have not heard before. This teaches us about the decedent’s life apart from ours and allows us glimpses into that life that we may cherish forever. When a loved one passes, we naturally question the meaning of life and death. Why did this person die? Why now? Why this way? Why does it have to hurt so much? What happens after death? To heal in grief, we must explore these types of questions if we are to become reconciled to our grief. In fact, we must first ask these “why” questions to decide why we should go on living before we can ask ourselves how we will go on living. This does not mean we must find definitive answers, only that we need the opportunity to think (and feel) things through. On a more fundamental level, the funeral reinforces one central fact of our existence: we will die. Like living, dying is a natural and unavoidable process. (Many tend not to acknowledge this.) The funeral helps us search for meaning in the life and death of the decedent as well as in our own lives and impending deaths. Each funeral we attend serves as a sort of dress rehearsal for our own. Funerals are a way in which we as individuals and as a community convey our beliefs and values about life and death. The very fact of a funeral demonstrates that death is important to us. For the living to go on living as fully and as healthily as possible, this is as it should be. As we have said, funerals are a public means of expressing our beliefs and feelings about the death of someone loved. In fact, funerals are the public venue for offering support to others and being supported in grief, both at the time of the funeral and into the future. Funerals make a social statement that says, “Come support me.” Whether they realize it or not, those who choose not to have a funeral are saying, “Don’t come support me.” Funerals let us physically demonstrate our support, too. Sadly, ours is not a demonstrative society, but at funerals we are “allowed” to embrace, to touch, to comfort. Again, words are inadequate so we nonverbally demonstrate our support. This physical show of support is one of the most important healing aspects of meaningful funeral ceremonies. 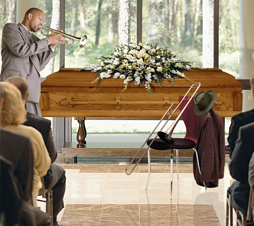 Finally, and most simply, funerals serve as the central gathering place for mourners. When we care about the decedent or his / her family members, we attend the funeral if at all possible. Our physical presence is our most important show of support for the living. By attending the funeral we let everyone else there know that they are not alone in their grief.